East tells the story of east Manchester’s ongoing regeneration. It's about places being transformed and projects that make a difference. 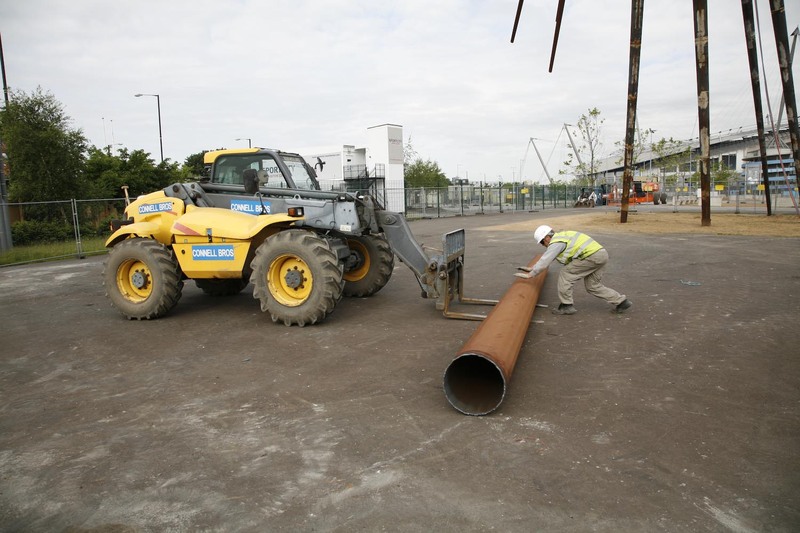 But most of all, East reports on local people's contribution to the UK's most ambitious regeneration project. For week after week the 180 spikes have been painstakingly removed until the central core sat, bereft, upon the five legs. 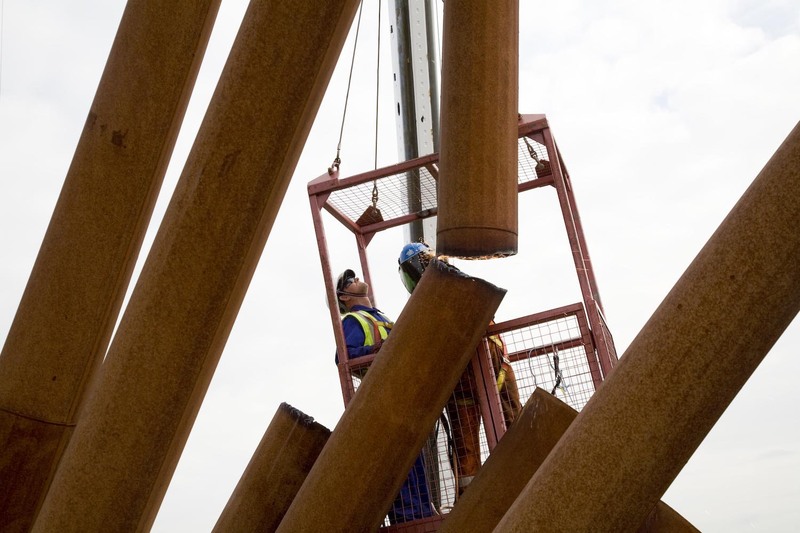 Yesterday [1st September] contractors from Connell Brothers set about dismantling the core and the remaining legs. 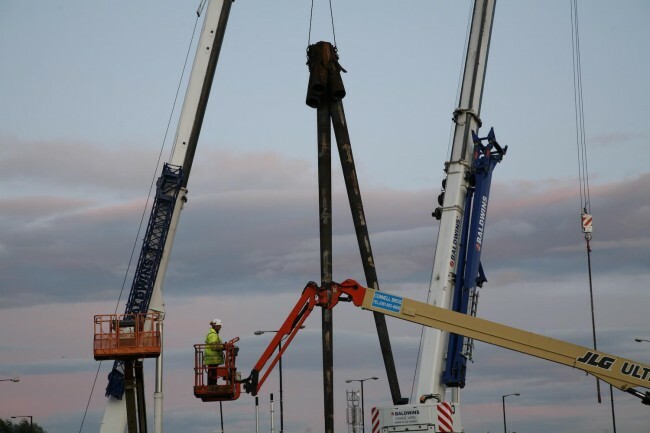 From early morning a 110-tonne crane, its chains threaded through the redundant steel, supported the core as the first three legs were cut, one after the other, and lowered to the ground. The process was deliberately slow and considered, safety being the main concern. 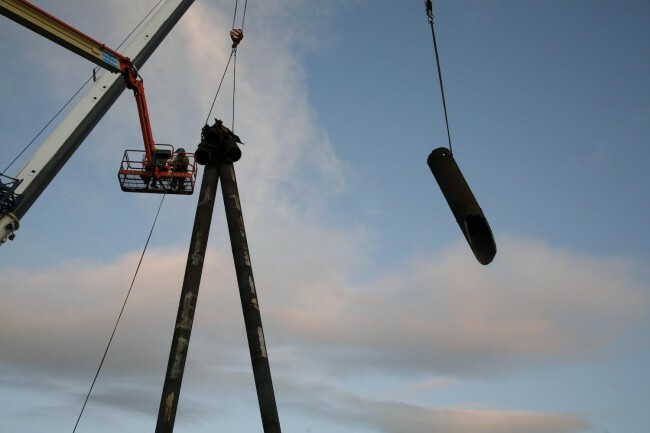 By early evening the core was supported by only the two front legs, the massive crane supporting its weight. As daylight faded ‘cherry-picker’ baskets were again manoeuvred into place as workers severed the remaining legs. By 9.30, the core was finally separated and brought to rest. 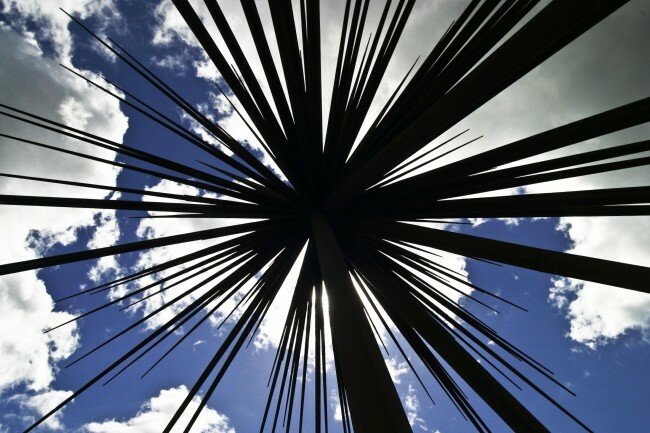 The demise of Britain’s tallest sculpture was complete. 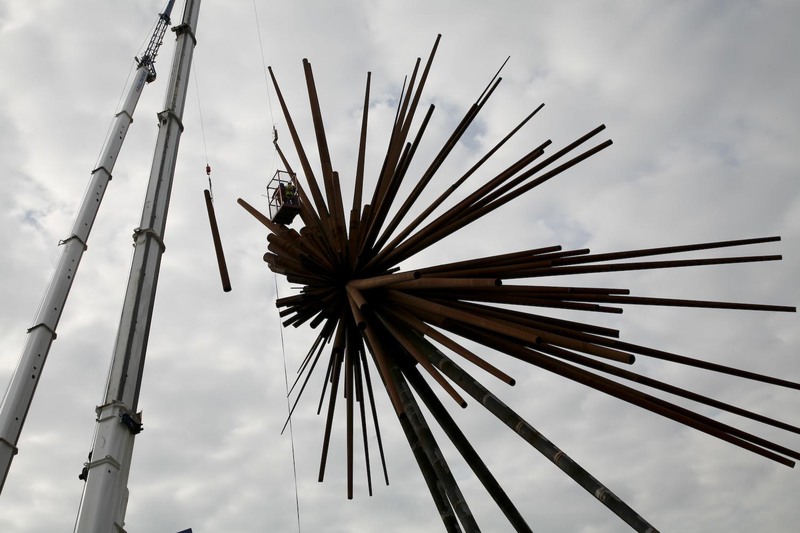 The last of the 180 spikes have now been removed from the B of the Bang. 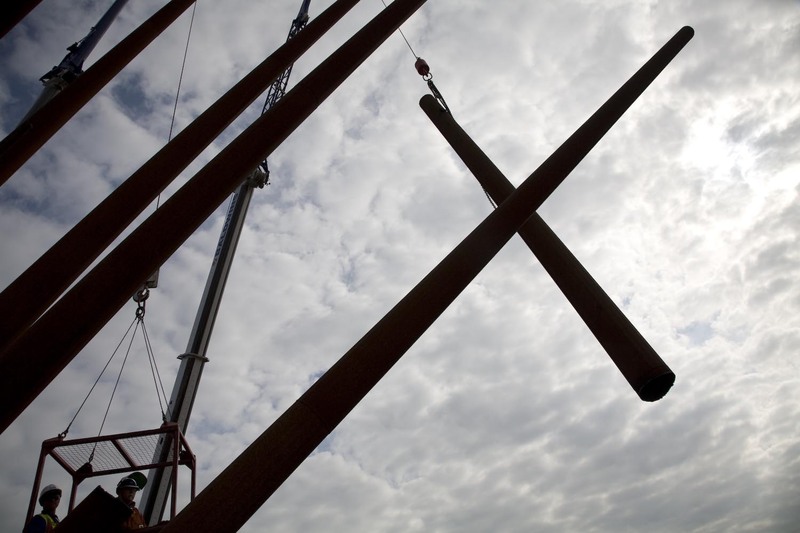 The sculpture’s core sits bereft on top of the five slanting legs, the dismantling contractors deciding how best to bring it to ground level. Len Grant was on hand to capture the final moments. 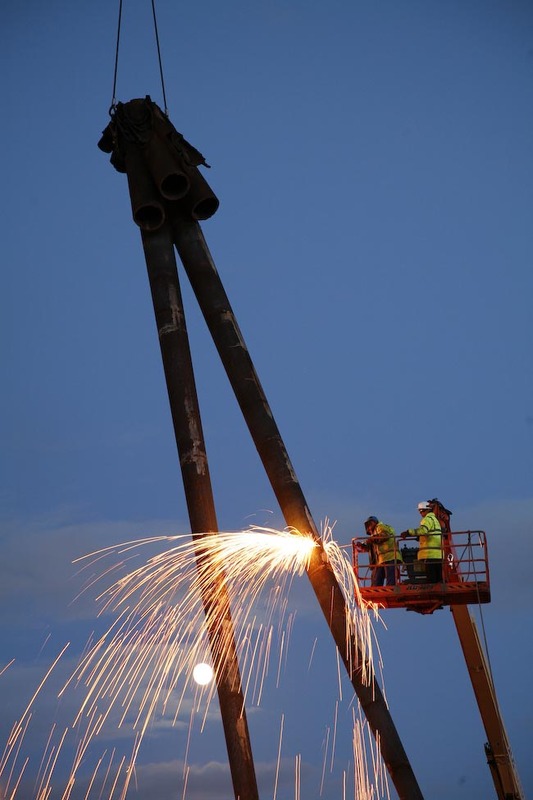 It was less than five years ago that I was in hard hat and yellow vest, photographing the B of the Bang being constructed. 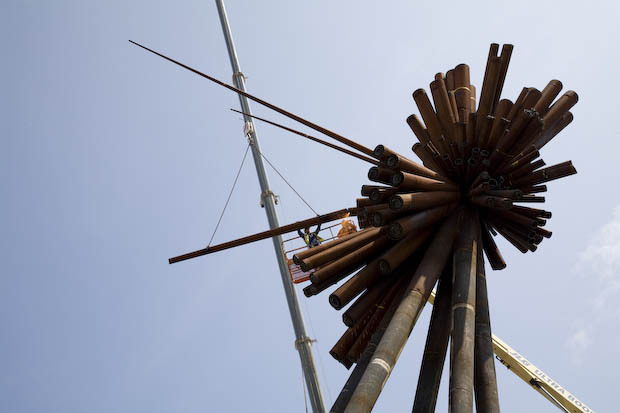 An intricate scaffold had been erected around the central core as cranes lifted spike after spike to be bolted and welded into position. Something unique and exciting was happening. Photographers and film crews regularly positioned themselves across the road junction, as Britain’s tallest sculpture grew. There was even a feature on BBC’s Newsnight. 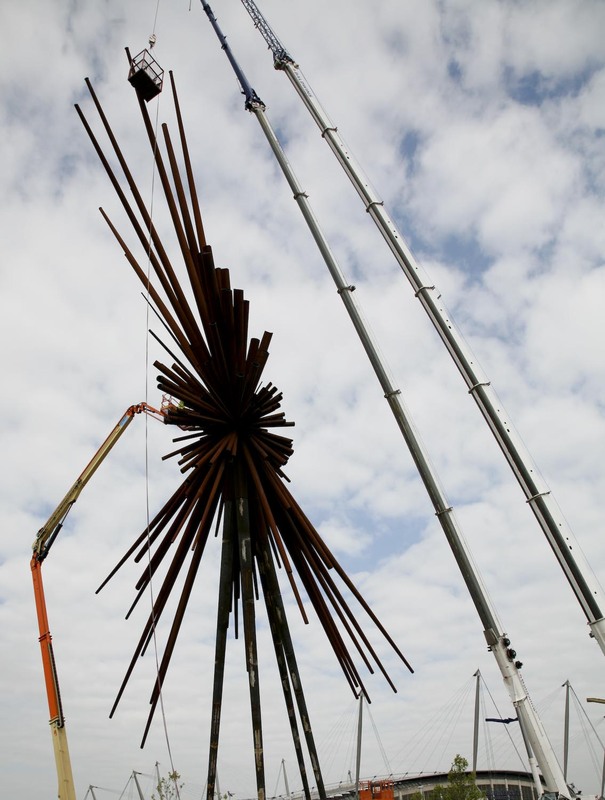 Now it’s June 2009 and I am back on site again, this time documenting the sculpture being dismantled. It saddens me that the life of this spectacular structure has been cut short, although its demise was inevitable after a catalogue of insurmountable problems. 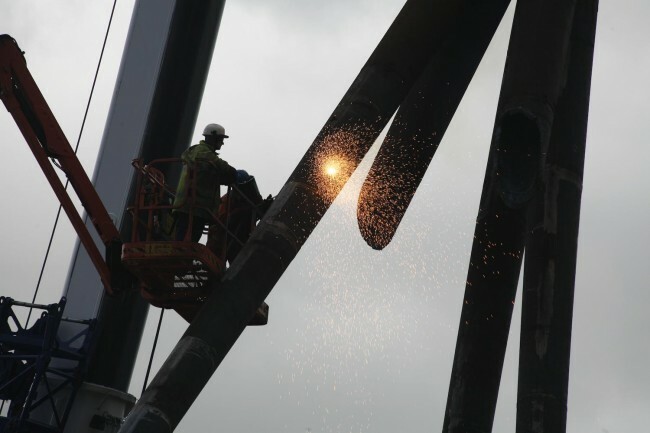 The cranes and the man-rider baskets are back, but this time the workers have oxyacetylene torches rather than welding irons. I’ve met these guys before: Connell Brothers demolished Maine Road football stadium in 2004, a job most of them relished, as they were all United fans! 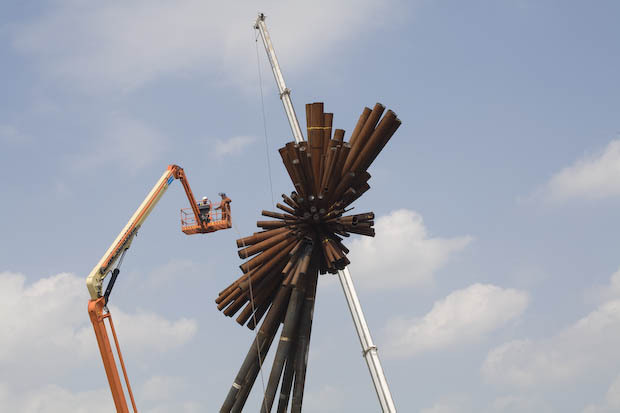 This morning Neil Doherty from Connells has offered me a trip in the ‘Ultra Boom’, a gigantic telescopic cherry-picker that will take us up about 30 metres alongside the sculpture’s central core. 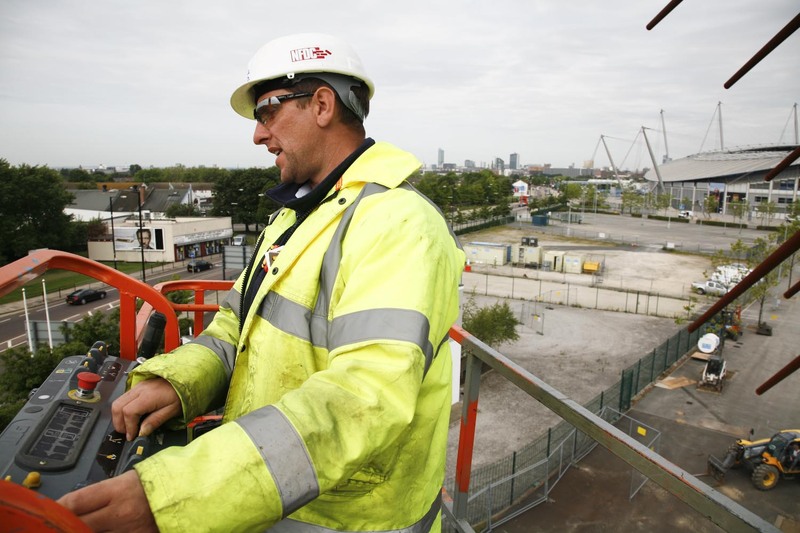 Having completed my site safety training on a previous visit, I step into a harness and climb onto the small metal platform. As Neil starts the ascent I soon have great views across Beswick and Clayton, and towards New Islington and the city centre. Most of the spikes have already been removed from this side, the tightly-packed truncated stumps a reminder of the design complexity of Thomas Heatherwick’s creation. Normally, heights don’t worry me, but as we get level with the man-rider basket, our platform wobbles ominously. I look down. “No, no. This will be fine,” I reply, concentrating on taking pictures to take my mind off my exhilarating -– and yet precarious – situation. 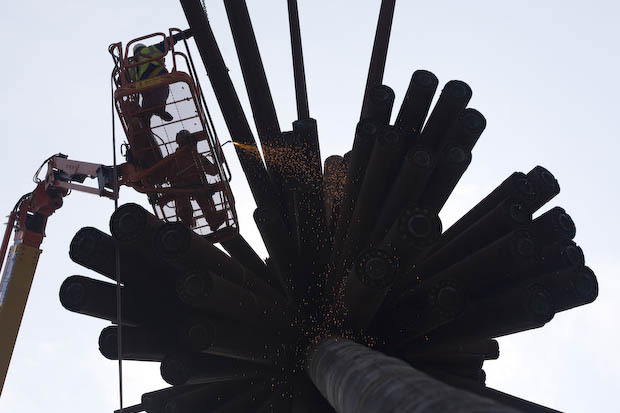 In the man-rider work is underway to remove another of the 180 spikes. 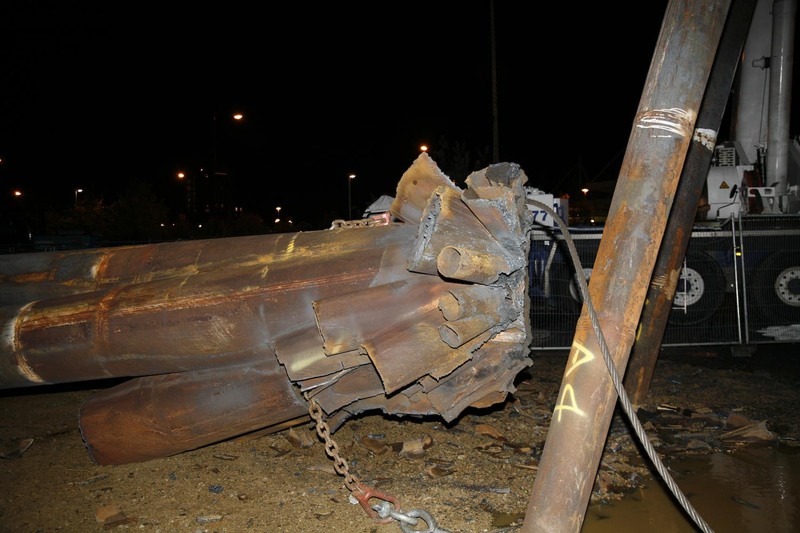 They have already cut a hole in the tapered end of the spike and threaded through a chain which will lower the dismembered appendage to the ground. Thankfully it takes only a couple of minutes before the final section is cut and the hollow spike breaks clear. I follow its descent and then suggest to Neil that I have plenty of images from this angle and we head down. 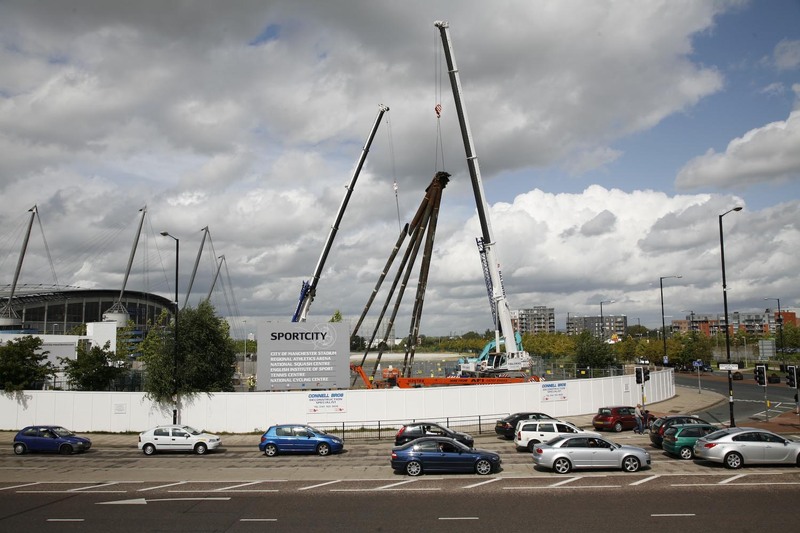 The site will be cleared within weeks: cranes, men and spikes gone. It’ll be a sad day for me. 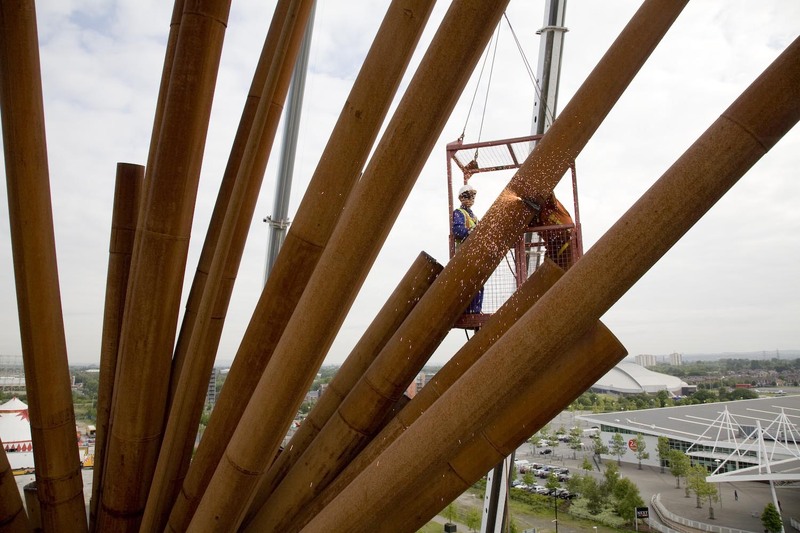 East photographer and self-confessed B of the Bang fan, Len Grant, documented the construction of the sculpture in 2004. 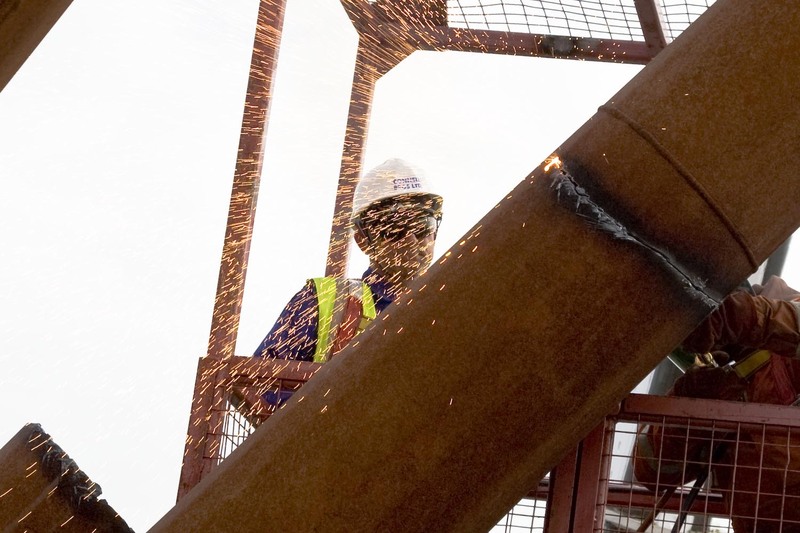 Unresolved safety issues has meant that it has to come down before its time. Before the beginning of the end, Len took his tape recorder to gauge public opinion on the Bang’s demise. Don’t forget to turn the volume up on your computer. 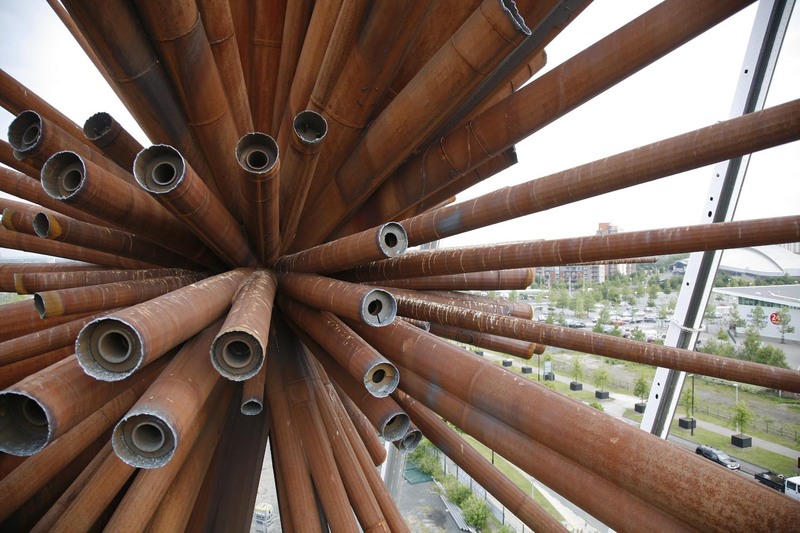 Revisit thisiseast.com over the next few months and follow Len’s images of the B of the Bang being dismantled.